< 100 Face Challenge: Mooooooo (#9)! copying is a great exercise in improving! Your bird is so cute!!! Thanks, Rebecca! It has really been great for me; it’s helping a lot. Oh this is so cute!! I’ve never really copied anything, maybe I should. Maybe for the next Bird Day, if I don’t forget all about it again! I hope you try it, Iris! I have learned so much this way! It’s never too late to join in the birdie celebration! OH Laura! This is magnificent! It is so sweet and cute and the details are amazing! The feet ROCK!!!!! Thanks, Jodi! This was the first time I got bird feet to look good! I was so happy with this. On difficult subjects, I’m finding copying another artist’s drawing is way easier than trying to draw from a bird directly. It really helped a lot! Great illustration, as usual! Hope you have a wonderful weekend, Laura! Thank you, and you the same! I’m so glad you enjoyed it! I’m so glad you enjoy it, Mimi! Great job with the details! Thanks, Kathy! I was a big ol copycat, but it’s a great learning experience! Thank you so much, Michael! It was so much fun to do. I’ve copied so many illustrations from that book. It’s teaching me a lot. 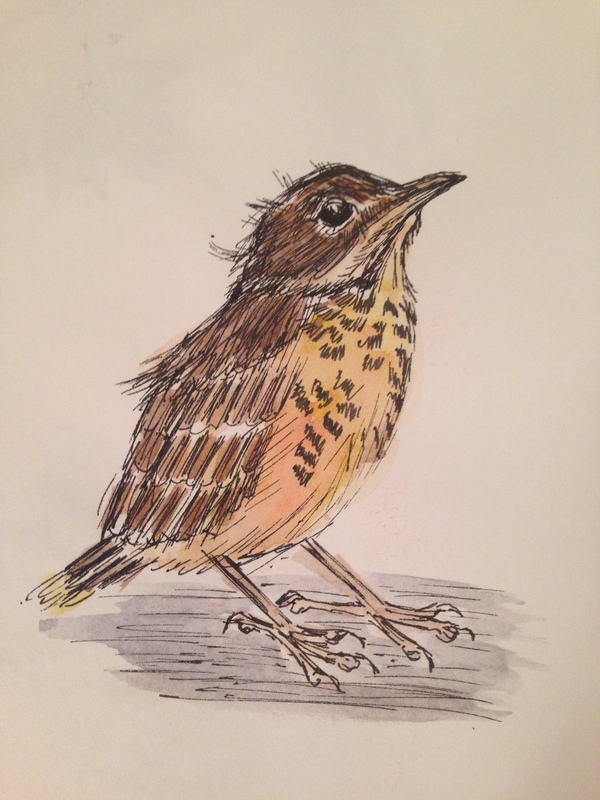 Oh love your pen work with this bird study, nice details with the feathers! Thank you so much, Jennifer! I tried to go fast but yet still get those details here and there. I’m so glad you like the pen work. Really trying to improve that at this point. You are doing great! Have a great day and weekend! Great job. Love the coloring, the feet, the shadow, the tilt of the head, the stray feathers. I like everything about this wee bird. I learn so much from copying as well. Nice work! Thanks, Kirk! I fell in love with it too, which is why I copied it! Her illustrations are so cool and that book is worth reading. My library had it. Kerfe has also read and liked. I know you’re getting more busy than normal now, but you may really enjoy it! Her book is full of her artwork and each is more appealing than the next. She is a naturalist and her stories are wonderful, by themselves. Just ordered it–our library had it as well. I love her title and the subject intrigues me. I’m glad you are like those Canson pads. I’ve got several (at strategic locations around our house) and continually grab at them to make a quick drawing. They are wonderful! I could not believe how well this sketch turned out, given the paper was pretty thin. I think that recommendation may change my life, because this year, I may make one of those books my organizational partner. All notes in one place, thoughts about my drawings, to do lists, helping me focus on goals for the day. Thinking of trying that this year. I have a Day-Timer but that stays in the office. This would go everywhere else. Thanks again, Kirk. I’m glad you are going to be able to pick up this book! Thank you, Fabio, for your visit and kind encouragement! Really a great job on this guy! I am familiar with Julie’s work and she is indeed awesome! Awww, it’s darling and I just want to scoop it up and hug it (but I know better than to do that with wild animals! LOL!). He’s cute Laura – real nice work on this drawing. So cute, looks like a young bird, happy weekend! Thanks so much, I hope to! You too! Awesome! What a beautiful copy :-)! I’ve been thinking about copying some of the drawings in that book too but I haven’t gotten around to it yet. I love that you picked one of her baby bird sketches. They are so darling with their feather fuzz, big eyes and funny beaks. Oh, I hope you do, Myriam! I’d love to see them – you really are a terrific artist! The babies really are so cute!! The hummingbirds were fun to draw and paint too. Thanks for the encouragement Laura :-). You’re really fun to draw with! Your work is amazing though! Anyone with a working brain would be crazy not to encourage you! I AM Dancing, Jill! 😀 I was so happy with these feet – I’ve not done them well before or since, lol. It requires going slowly and carefully and I am good at neither! That book is wonderful – I hope you enjoy it, if you do pick it up! Boy, Catherine, I wish I knew and could tell you. Have you tried the site “Paint My Photo”? If you google that one, all of the photos there are posted with no restrictions on usage for artists (as I understand it). You do have to be a “member” but I believe it’s free. Something to think about maybe? I hope this helps. Thank you so much, Ann! This actually reminds me of something sweet that you might choose to do. It has that endearing glance that so many of your subjects have. I was happy with this one, so I had to share it. Her illustrations have been fun to work with. Glad you love it so much! Wonderful! I am having fun checking out every one elses drawings of birds!! It’s so much fun to see WP fly! 😀 So glad you enjoyed this one, Susan! Beautiful and adorable painting. Makes the heart soar seeing delightful gems like this. Awwwww…..wow, what a kind comment, Haunani, thank you so much! what a little cutie! love it. I have that book on my library list…now I can’t wait to borrow it! Yay! It’s a terrific book!! I love this laura!! what is great combination of colors and so subtle. Bravo! This really is a very lively bird; well drawn! Thank you so much for your visit & comment! I really appreciate your encouragement! Thanks so much! I found that illustration in a book about birds and decided to draw and paint it. I was happy with how it turned out, but it wasn’t my idea. Glad you like it!